In November of eighteen forty, the American people elected their ninth president, William Henry Harrison. The election of the retired general was expected. Still, it was a great victory for the Whig Party and a sharply felt loss for the opposing party, the Democrats. They failed to put their man, President Martin Van Buren, in the White House for a second term. Whig leaders made most of Harrison's campaign decisions. Some of those leaders, especially senators Henry Clay of Kentucky and Daniel Webster of Massachusetts, believed they could control the newly elected president. But Harrison saw what was happening. When he made a trip to Kentucky, he made it clear that he did not want to meet with Clay. He felt that such a meeting might seem to show that Clay was the real power in the new administration. But Clay made sure that Harrison was publicly invited to visit him. The newly elected president could not say no to such an invitation. He spent several days at Clay's home in Lexington. This week in our series, Maurice Joyce and Jack Moyles discuss the presidency of William Henry Harrison. Daniel Webster, without even being asked, wrote an inaugural speech for the new president. Harrison thanked him, but said he already had written his speech. Harrison spoke for more than one and a half hours. He gave the speech outside, on the front steps of the Capitol building. It was the coldest inaugural day in the nation's history. But Harrison did not wear a coat or hat. Harrison caught a cold, probably from standing so long outside in the bitter weather of inaugural day. Rest was his best treatment. But Harrison was so busy, he had little time to rest. Hundreds of people demanded to see the new president. They wanted jobs with the government. Everywhere he turned, Harrison was met by crowds of job-hungry people. And there was a problem that worried him. Henry Clay and Daniel Webster were fighting each other for power in the new administration. Harrison had offered Clay any job he wanted in the cabinet. But Clay chose to stay in the Senate. Harrison then gave the job of Secretary of State to Webster. He also gave Webster's supporters the best government jobs in New York City. Clay did not like this. And he told the president so. Harrison accused Clay of trying to tell him -- the president -- how to do his job. Later, he told Clay that he wanted no further words with him. He said any future communications between them would have to be written. Harrison's health grew worse. Late in March eighteen forty-one, his cold turned into pneumonia. Doctors did everything they could to cure him. But nothing seemed to help. 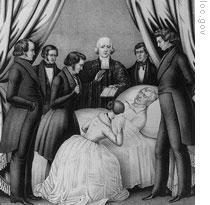 On April fourth, after exactly one month as president, William Henry Harrison died. Vice President John Tyler was then at his home in Williamsburg, Virginia. Secretary of State Webster sent his son Fletcher on horseback to tell Tyler of the president's death. The vice President was shocked. He had not even known that Harrison was sick. Two hours after he received the news, Tyler was on his way to Washington. He reached the capital just before sunrise on April sixth, eighteen forty-one. There was some question about Tyler's position. This was the first time that a president had died in office. No one was really sure if the Constitution meant that the vice president was to become president or only acting president. Webster and the other members of the cabinet decided that Tyler should be president and serve until the next election. Tyler also had decided this. Tyler was sworn-in as the tenth president on April sixth. He was fifty-one years old. No other man had become president at such an early age. Tyler was born and grew up in the same part of Virginia as William Henry Harrison. His father was a wealthy planter and judge who had been a friend of Thomas Jefferson. John completed studies at the college of William and Mary, and became a lawyer. He entered politics and served in the Virginia legislature. Then he was elected a member of Congress and, later, governor of Virginia. He also served as a United States senator. Tyler believed strongly in the rights of the states. As a congressman and a senator, he had voted against every attempt to give more power to the federal government. Tyler's political beliefs were strongly opposed to those of the northern and western Whigs. Henry Clay firmly supported the ideas of a national bank, a protective tax on imports, and federal spending to improve transportation in the states. Tyler was just as firmly against these ideas. There was something else. Clay expected to be the Whig Party's presidential candidate in eighteen forty-four. If he supported Tyler, then the new president might become too strong politically and win a second term in the White House. Tyler quickly established his independence after becoming president. Webster told him that President Harrison had let the cabinet make the decisions of his administration. He said Harrison had only one vote...the same as any member of the cabinet. Webster asked if Tyler wanted this to continue. "I do not," said Tyler. "I would like to keep President Harrison's cabinet. But I, alone, will make the decisions. If the cabinet members do not approve of this, let them resign." Tyler wanted to change the cabinet, but could not do so immediately. All but two members of the cabinet were supporters of Senator Clay. Tyler wanted to put these men out and appoint men who would support him. But if he did this immediately, it would split the party. He would have to wait. The Whig Party controlled both houses of Congress after the eighteen forty elections. Clay wanted a special session of the new Congress. He was able to get Harrison to call such a session before the president's death. At the session, Clay offered six resolutions as a plan of work for Congress. These proposed putting an end to the independent treasury, the establishment of a new national bank, and a tax increase on imports. They also included a new plan to give the states the money received by the federal government from the sale of public lands. It was no problem to put an end to the independent treasury. Tyler had opposed it during the campaign and in his message to Congress. Congress soon passed a bill repealing the independent treasury act. And Tyler quickly signed it. But a dispute arose on the issue of a new national bank. Tyler had his Secretary of the Treasury send Congress the administration's plan for a national bank. It would permit such a bank to be established in Washington. And it would permit the bank to open offices in a state, but only if the state approved. This was not the kind of bank Clay wanted. He wanted no limits of any kind on the power of a national bank to open offices anywhere in the country. Clay then offered a bill that would create just this kind of bank. There was much debate. And Clay finally agreed to a compromise. Bank offices would be permitted in any state where the state legislature did not immediately refuse permission. The Congress accepted the compromise. But President Tyler did not. He vetoed the bank bill and sent it back to Congress. This had been a difficult decision for Tyler to make. He wanted peace and unity in the party. But he also wanted to show that he -- and not Henry Clay -- was president. The people knew he opposed Clay's bill. If he accepted it, the people would feel that Clay was the more powerful. Clay did not have enough votes to pass the bill over the president's veto. Another effort was made to get a bank bill that the president would approve. This time, members of Congress met with Tyler to get his ideas. He explained, again, the kind of bank he would accept. He said the states must have the right to approve or reject bank offices. The congressmen wrote another bill. They said it was exactly what the president wanted. But the president did not agree. He said this second bill would also be vetoed unless changes were made in it. The changes were not made. And Tyler did as he said he would do. He vetoed it. This second veto caused a crisis in Tyler's cabinet. Our program was written by Frank Beardsley. The narrators were Maurice Joyce and Jack Moyles. Transcripts, MP3s and podcasts of our programs are on the Web, along with historical images, at www.unsv.com. Join us again next week for THE MAKING OF A NATION - an American history series in VOA Special English. 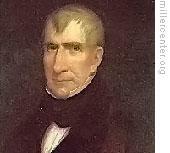 Willim Henry Harrison, the ninth president of the United States, died after only a month of his presidency because of serious pneumonia. he had had one and a half hours's inaugural speech outside in the coldest day . it maybe the direct cause of his sickness. after his death, John Tyler who had been a vice president took his office in White House. Tyler was the tenth president.